"The gameplay takes place from a 3/4 overhead perspective. Each wrestler shares a moveset in the game, with the exception of their signature moves. Every character performs a variety of suplexes, a backbreaker, a tombstone piledriver, an atomic drop, various diving attacks, and a variety of kicks, punches, elbow, and forearm shots. 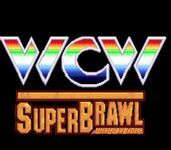 Modes of play include singles, tag team, an eight-man singles tournament, a tag team tournament between four teams, and the "Ultimate Challenge," where a player must defeat every other wrestler in the game. Different stipulations can be selected for matches; bouts can either be contested under one fall, first to three falls, or a time limit of differing lengths where the most falls within the time limit wins the match. During the course of a match, boxes pop up showing the referee counting, Tony Schiavone providing minimal commentary, and wrestlers saying a catchphrase after performing their signature move. The wrestlers will also pop out and say their catchphrase on the wrestler select menu." Source: Wikipedia, "WCW_Super_Brawl_Wrestling," available under the CC-BY-SA License.